The original image dates from about 1590 when it was brought to the Philippines from Spain by way of Mexico. 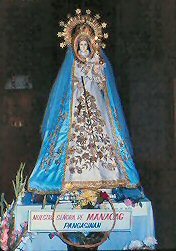 It is said that in 1610, a man walking home heard a Lady's mysterious voice and looking around saw a beautiful Lady with a Rosary holding a child. She stood on a cloud which hovered above a treetop. He told the people of his vision and soon a church was built on the spot. 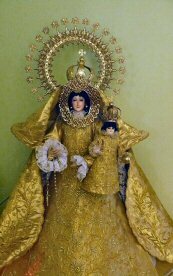 The Virgin's call to the man became associated with the name of the town, "Manaoag," which means, "She Calls." towns. The town of Manaoag was burned for this reason, but the thatched roof of the church could not be set on fire even though many flaming arrows were shot into it. During World War II, the Japanese dropped four bombs on the church. Three exploded in the nearby plaza, but the fourth which fell through the church's roof did not explode. Today the church contains many murals recounting the numberless miracles worked through Our Lady for those who ask for her assistance in their time of need. Our Lady of the Rosary is the patroness of the sick, the helpless, and the needy. The Archbishop Socrates Villegas said in a recent visit, "Our Lady has drawn millions of pilgrims seeking healing for body and spirit, success and victory in their undertakings, peace and serenity in the midst of life's troubles. 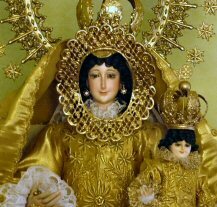 The poor and the rich, young and old, men and women, powerless and powerful - they are all children of the Virgin of Manaoag. No one has gone to Manaoag and left the shrine the same."